Rock the Ball is a sliding puzzle game created by Sweet Potato Games. Sweet Potato is a professional and dedicated team of developers working fruitfully to design fun and challenging games. Their latest game Rock the Ball launched recently on 4th February, 2016 is a free unblocked puzzle game. In just a month it has reached the second most downloadable ranking. Adults and children alike can play it. This game is compatible with all types of devices may it be a tablet or phone. Also it supports iOS / Apple / Android / Windows. After playing it for several days, I have realized that it teaches one great problem solving skills. With more than hundreds of levels, this game has been designed to exercise your brain and teaches you freshabilities. Usually people live a mundane lifestyle participating in the same day to day tasks. This stops the process of learning. While playing Rock the Ball you face challenges with which you can gain the expertise to become a problem solver. How to Play Rock the Ball? Rock the Ball is a slide puzzle, where numerous blocks are placed inside a grid. Some of these are fixed while other can be moved. There is a silver ball for which the path has to be unblocked. The point of the game is to move these blocks to create a pathway for the ball in the least moves possible. The player is required to think of minimum possible moves to the correct path for the ball to reach its destination. Finishing a level in the least moves, will give players three golden stars and a high score reward. Don’t be worried as there is an undo and refresh option which eliminates the last move and brings back the level to its initial position respectively. So if you are stuck anywhere, simply press undo button at the bottom of the screen. Another aspect of this game is that your progress is saved online with Google+ and you can play any time you are free. Just start off from where you left. This game helps you deal with complex problems. It is a Match – 3 Puzzle, which is based on developing puzzles from the simplest to the most complex. The game starts off with simple and easy to solve obstacles and hurdles. As the levels advance, the complexity of puzzles increases. This builds a great capacity of problem solving in players. They learn the tactic of enhancing their cognitive abilities and learn the dexterity of solving complex life problems. Coming out of your daily routine and playing this game, lets you develop new habits. It exposes you to develop new connections in your brain which were previously not there. This way the game is able to provide a stimulus to the brain. Overcoming the unblocked puzzles and hurdles in the game, is an entertaining and challenging experience. Rock the Ball is a sliding puzzle that is simple to understand and play. An effortless swipe of the finger is required to move the blocks to another location. That’s why even children can play it easily. It helps to teach kids a lot. They learn motor skills i.e. the ability to navigate their muscle movements along with their brain signals. Kids also learn to face challenges and how to conquer them at an early age. This way not just adults but children as well are able to build their intelligence. Indeed, Rock the Ball helps users to think outside the box. It provides a stimulus to the brain when playing any puzzle and boosts brain activity. This way you are using your brain in new ways never used before. The game is not designed to give players a headache. Rather one should look at the puzzle and think about possible solutions and moves before starting to play. This will teach them to remain patient not just in the game, but in their real life problems too. These days when playing online or mobile games has become a popular hobby and pass time, people often indulge in unhealthy activities. There are only a handful of healthy games, activities or applications available for people to indulge in their leisure. Fortunately, Rock the Ball is one such game. 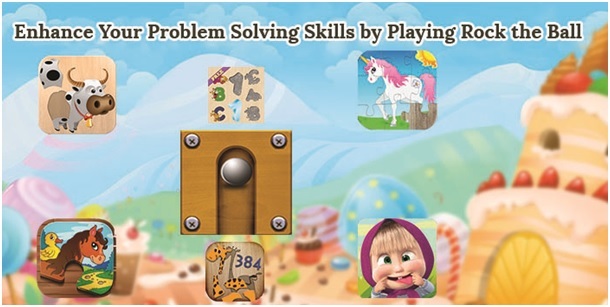 It is a healthy brain teaser which inculcates new skills in people. It lets people exercise their minds by finding solutions to puzzles. In turn, in their real life, players can use this experience to become better at solving real life issues and problems that they face.